In September 2015, the European Parliament officially adopted the Written Declaration on Autism. In 2018, Autism-Europe took a further step towards an EU autism strategy by presenting a set of key recommendations to the European Commission, in the context of ASDEU initiative. 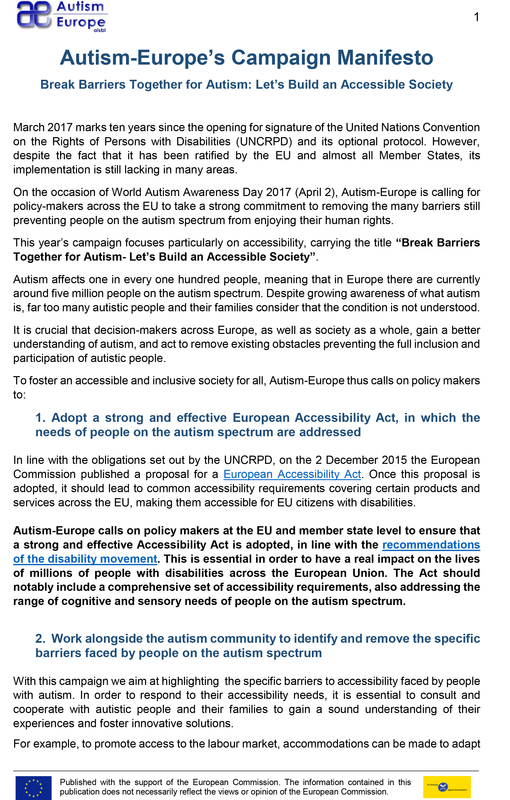 Following the European Parliament’s overwhelming support in 2015 for the Written Declaration on Autism, which called on the European Commission and the European Council to adopt an EU Strategy for Autism, AE has continued to build momentum for European plan address the support needs of the autism community in various areas of life. On the 30 January 2018, during the final conference for the ASDEU programme in Madrid, Autism-Europe’s Director Aurélie Baranger presented the list of initial key recommendations for a holistic EU autism strategy to over 100 delegates, including representatives from the European Commission, and national ministries. The recommendations take into consideration the specific competences of the EU. They span several areas to address the needs of autistic people in Europe: screening and diagnosis, access to health, education, individual lifelong support, employment, training of professionals, independent living, legal capacity, empowerment of autistic people and their families, as well as research. Closing the conference, Antoni Montserrat, Senior advisor in the European Commission Directorate of Health and Consumer Protection, welcomed the high relevance of Autism-Europe’s recommendations for a future EU strategy on autism. He also called on EU Member States representatives to support such an EU autism strategy at their governmental level, given that a clear impulse of the Council of the European Union is paramount to have such a strategy come to light. What is a Written Declaration of the European Parliament? 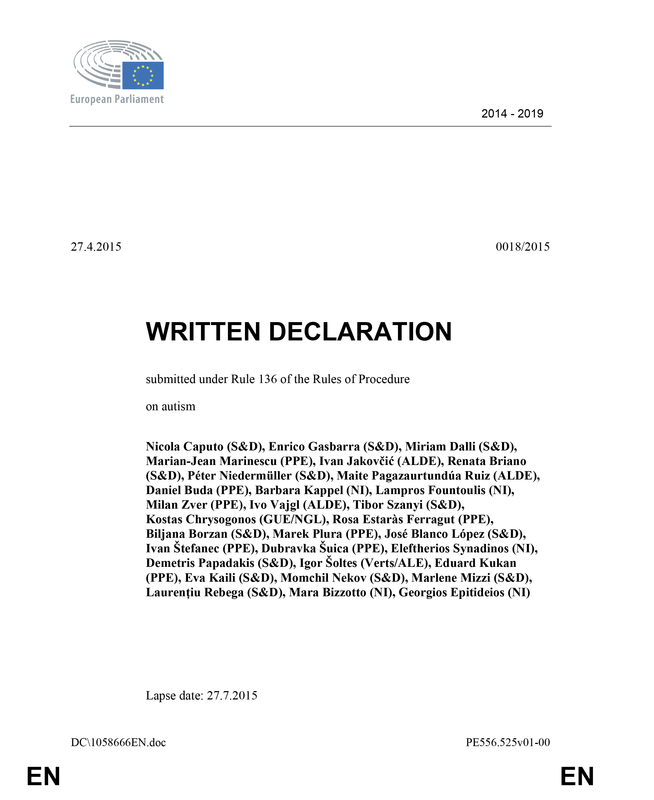 A written declaration of the European Parliament is a principled document that gives direction to the institutions of the European Union and EU Member States. For example, in 1996, the European Parliament adopted a written declaration called the ‘Charter for Persons with Autism’, which was drafted by Autism-Europe. 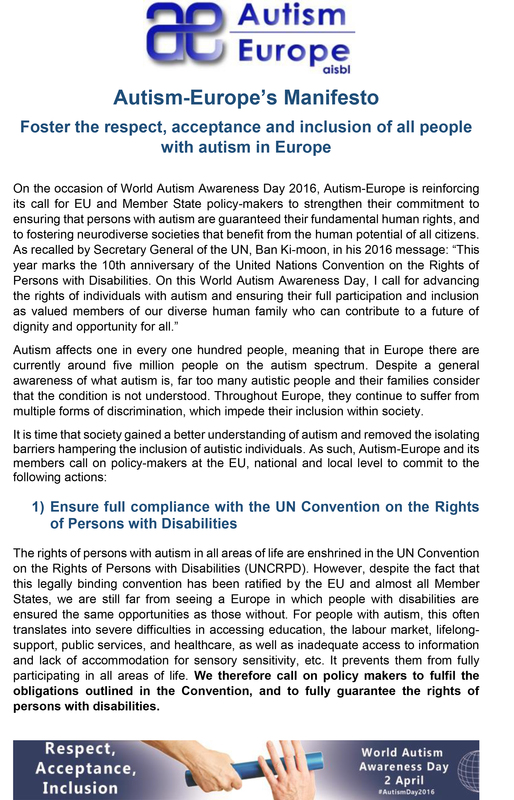 Many Autism-Europe members have used this charter to advocate for improvements in support for people with autism at national level. Written declarations of the European Parliament do not, however, call for any legislative action and are not enforceable by the institutions of the European Union. 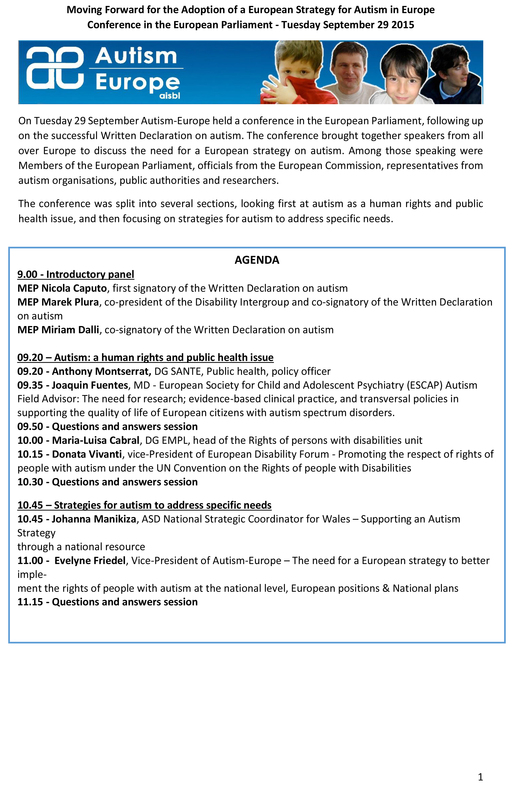 Following the endorsement by 418 MEPs of the Written Declaration on autism, a conference was held in the European Parliament on 29 September 2015. It was co-chaired by MEP Nicola Caputo, MEP Marek Plura (co-signatory and co-President of the disability intergroup) and MEP Miriam Dalli (co-signatory). The panel involved autism representatives and experts, as well as key representatives from the European Commission.